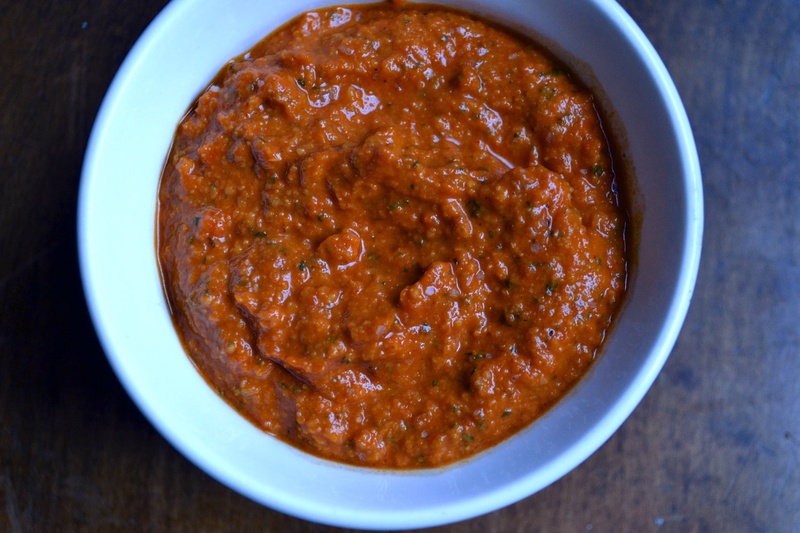 Romesco sauce…where have you been all my life! This spanish or rather Catalan sauce is smoky and vibrant and loves to be served with veggies, chicken, roasted potatoes, sandwiches, a spoon, whatev…it’s awesome. It’s a puree of roasted red peppers, tomatoes, hazelnuts (optional), almonds, vinegar, smoked paprika, olive oil, and garlic. This recipe was inspired from the Food Matters Project series and was chosen by My Healthy Eating Habits. The original recipe that was chosen was Roast Potatoes with Chicken and Romesco sauce. Because it’s a never ending scorcher here in KC, my oven is NOT coming on. 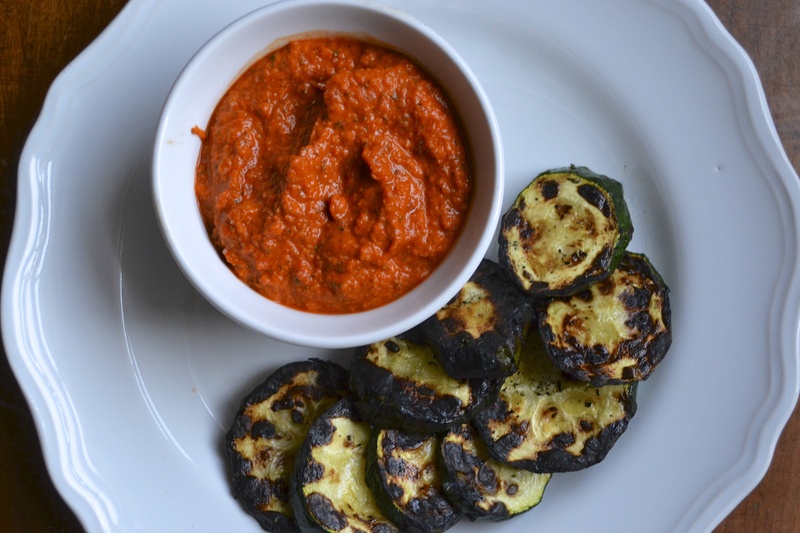 Therefore, the grill was fired up last night and this romesco sauce topped buffalo burgers and grilled zucchini. Romesco is like an old friend that you haven’t talked to in awhile but as soon as you see her, it’s like there was never a gap in time. You pick up right where you left off. Romesco will be there when you most need her. Quick dinner? Done. Serve romesco sauce with grilled shrimp or chicken or burgers. Side dish?…shya, she’s rocking the skillet potatoes or grilled zucchini. Snack? She wants to be with pita chips or carrots or your fist. Breakfast? What? ya…there she is topping an omelette. Add all ingredients, except olive oil and salt to the bowl of a food processor. Pulse until all ingredients are combined. Drizzle olive oil while processor is running to combine. Season with salt. Keeps refridgerated up to 1 week. Freeze for up to 3 months. Zucchini! Good idea. I’ve had it on green beans, but zucchini sounds even better. Thanks for the idea. Great ideas for my leftover sauce! great idea for zucch overflow and the leftover sauce! This looks delicious! I love the brilliant red color of the sauce in the food processor. What a great way to use romesco sauce! I love it! I am with you on the romesco-on-everything-train. It is one of the most versatile sauces! Great ideas! So far since last night I have already dipped crackers, sourdough, green beans, and zucchini in mine…next up for dinner tonight, leftover roasted veggies with quinoa and…wait for it…romesco! The Sauce looks wonderful and the color is so vibrant. 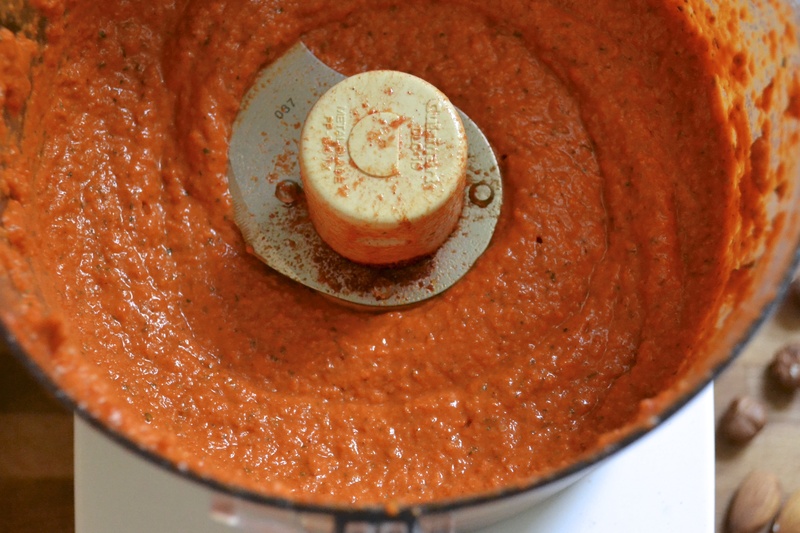 Great photo of the sauce in the food processor- so vibrant!